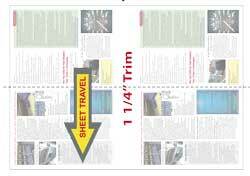 To run this particular example 2-up you need a folding machine 23” or wider. But just because it fits on the machine doesn’t mean you can simply trim it 2-up in the parallel and then run into the right angle, especially with a conventional 1/4” trim between the two units. It requires either a hardware solution or a layout solution. The problem in our example is this: the 8.5x11 trimmed and folded pieces entering the right angle cross carrier have just 1/4” space between them. In most cases this is not enough. You’ll end up with sheets bumping each other on the cross carrier or, depending on the fold plates and fold sizes, jamming inside the fold plates. If you do a lot of this type of work, the hardware solution is best. Most folding machine manufacturers offer a “split guide” for right angle sections to solve this problem and allow 2-up, high-speed production. (photo upper right) This lets you run at maximum speeds without as much concern for the trim/spacing issue. But what if you don’t have a split guide or one’s not available for your machine? In that case you have to go with the layout solution. This suggestion came to us from Reno Cyr of JS McCarthy. The idea is simple: you build in the spacing when you lay out the job. Reno had to run a huge quantity without a split guide, folding and wet-scoring a 40# 11x17 text in half and then down to a #10. Using the space available on the printed sheet, they inserted a 1.25” trim to give him the required gap on the right angle cross carrier. The net result was a 50% increase in yield. Running 1-up netted about 12,000/hour while running 2-up netted about 18,000/hour. Naturally there are pros and cons to consider before committing to the final layout. You save money by reducing time spent on the guillotine cutter and increasing folding machine yield. The job is delivered faster. You gain extra capacity on the folding machine by freeing up production time. In a busy shop, production time is worth its weight in gold! It could cost you more in paper so you need to carefully put pencil to paper. In many cases however, there is plenty of extra waste paper around the edge of the sheet, so you just move it to where you need it. It will take slightly longer to make ready, so you have to do the math to find your breakeven point. The folder operator may also have to tweak the cross carrier marbles or cones to get consistent performance and spacing. You should take time to test your layout. There are many variables that will affect how the job will run, including sheet size, folding machine speed, folding configuration, number of folds and type of paper. A .75” trim that runs successfully on one job may not be enough on another so you’ll want to find that out before you print the job. It would be a shame if you were forced to run a job 1-up for lack of a little bit of extra trim. It’s obvious that for long-run jobs, a 50% increase in average production is substantial and well worth consideration. Just be sure to do your homework so you have plenty of trim for your built-in spacing.